The 2018 Tour Championship not only marks the conclusion of the 2018 PKBGT National schedule, but also the conclusion of the Bell and Futures National Order of Merit races. In the Bell National Order of Merit, Amanda Sambach has locked up the Order after winning the 2017 PKBGT Invitational, the 2018 PKBGT Open Championship and the 2018 PKBGT Precision Girls Championship. Without any of her competitors in close reach competing in the Tour Championship, Sambach is projected to win the 2018 Bell Order of Merit for the second year in a row! 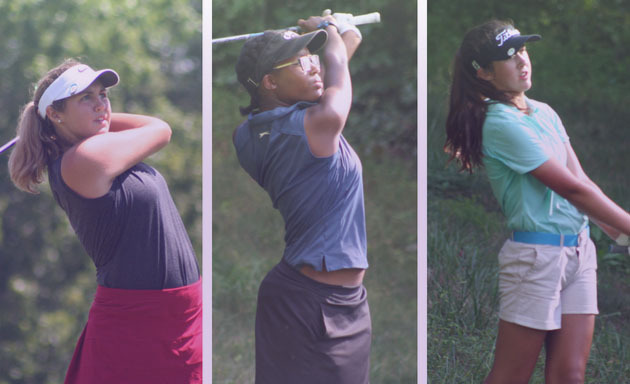 Sambach joins two other PKBGT alumni in winning the Bell Order of Merit twice, PKBGT legend and LPGA Tour Professional Katherine Perry and Symetra Tour Professional Lucia Polo. The Futures National Order of Merit presents a different scenario. With the 8 of the top 10 of the Futures Order of Merit competing in the field, the final round of the Tour Championship presents an exciting finish to not only the tournament but the Order of Merit. Three players are in the mix for the Order of Merit trophy! Amber Mackiewicz (Virginia Beach, VA 2023) currently leads the Futures National Order of Merit with 232.25 points over 17 rounds and 9 events this season. She currently sits in 6th place in the championship after posting consistent rounds of 76-75, just 7 shots off the lead heading into the final round. McKenzie Daffin (Fort Bragg, NC 2021) sits in 3rd place on the Futures National Order of Merit and over 14 rounds and 7 events. McKenzie sits in a tie for 10th place at the championship with scores of 79-78, including a hole-in-one on the 12th hole of her first round of Friday. But what stands out about this season finish to the Order of Merit is that only the best 5 finishes (events) of the season count towards a player’s Order of Merit standing. This brings Annabelle Millard (St George, UT), who currently sits in 5th place, into the mix for the Order of Merit race. Millard, who now resides in Utah, has only played 4 National events this year, allowing her to earn a considerable amount of points with a top performance in this weekend’s championship. We look forward to an exciting finish of the event and the 2018 National Order of Merit! Follow the final round action tomorrow at livescoring.pkbgt.org and on our Instagram and Facebook feeds.